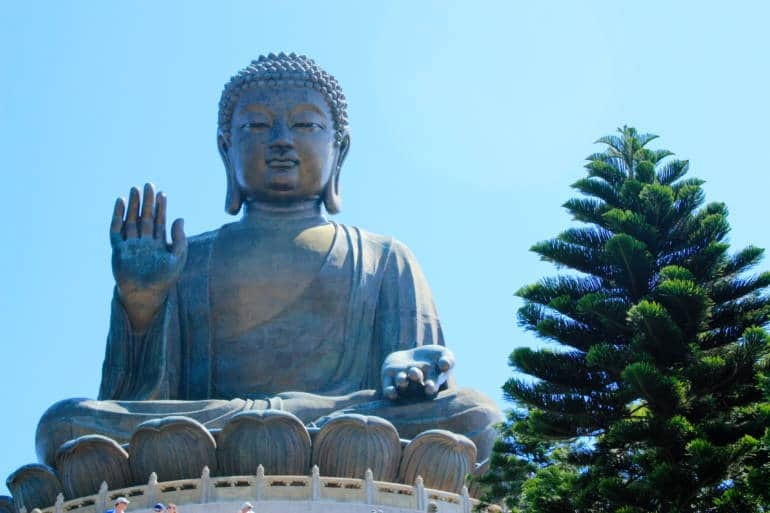 The Tian Tan Buddha, more commonly referred to as the ‘Big Buddha’, is one of the largest seated Buddhas in the world, and a major icon of Hong Kong. It took 12 years to build the impressive 250-tonne bronze statue, and since its unveiling in 1993 it has attracted millions of tourists and worshippers. 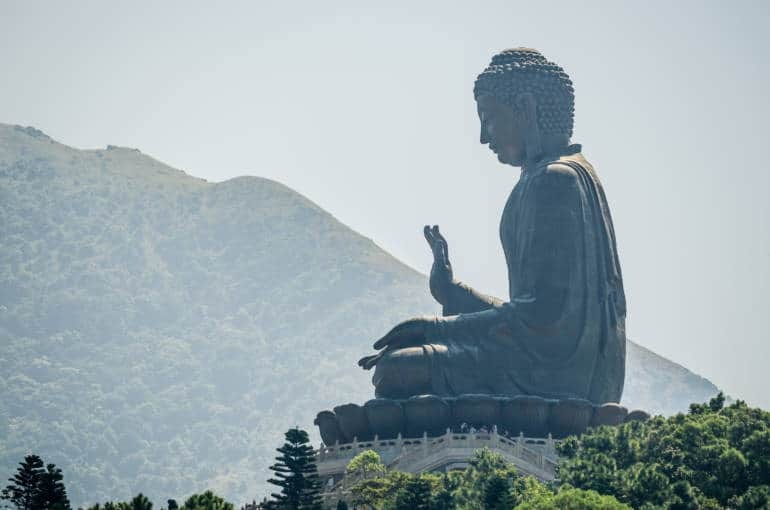 Getting up to the Big Buddha is half the fun, due to its remote location, tucked away in the mountains of Lantau Island. The best and fastest way is to enjoy a scenic 25-minute gondola ride from Tung Chung, called Ngong Ping 360. The alternative is a long, winding bus trip through the mountains from either Tung Chung or Mui Wo, so if you suffer from motion sickness, definitely take the cable car. Both the cable car and the buses arrive at Ngong Ping Village, a slightly kitschy Chinese-style pedestrian area with shops and restaurants. From there it’s a short walk along the Ngong Ping Piazza, where you’ll see a very ornate beautiful white gate, leading you to the Big Buddha. The perfect place to snap some shots of the Big Buddha is from the bottom of the steps, looking straight up. Then, get ready to climb the whopping 268 stairs to get the top, where you are rewarded with views of the South China Sea in the distance, as well as Ngong Ping Village and the Po Lin Monastery below. At the base around the Big Buddha, you’ll notice six other bronze statues, ‘The Offering of the Six Devas’, holding up flowers, incense, ointment, fruit, a lamp, and music to the Buddha. After climbing back down, head over to the grand Po Lin Monastery, with ornate architecture featuring dragons, phoenixes and other animals. A centre of worship since 1906, the monastery is home to the Grand Hall of 10,000 Buddhas, and in the courtyard you can see people lighting massive sticks of incense—some as tall as an adult—and praying. Nearby is Wisdom Path, a scenic walkway through the forest, where 38 large wooden columns have been inscribed with the complete verses of the Heart Sutra. A trip to the Big Buddha can easily be combined with another tourist attraction on Lantau Island, the Tai O Fishing Village. New Lantau Bus #21 goes from the Ngong Ping Bus Terminal to Tai O, where you can visit a unique fishing settlement with stilt houses and a bustling market. As mentioned, New Lantau Bus runs a bus service from both Tung Chung and Mui Wo to the Big Buddha. If the cable car lines turn you off, you can get to the Buddha by taking Bus #23 from the New Lantau Bus terminal in Tung Chung, which is next to the cable car station. An alternative route is to take a ferry from Central to the quaint seaside town of Mui Wo, and then take Bus #1 to Ngong Ping, which leaves right outside the ferry pier.